The most notorious, perhaps the most powerful group ever to invade the world of manga, Genei Ryodan deserves a huge fandom for the character profiles alone. The story focus has been diverted awhile to introduce equally interesting and challenging casts, primarily Kuroro Lucifer, the leader of the renowned thief group with 13 nen user members, which he named after a spider. 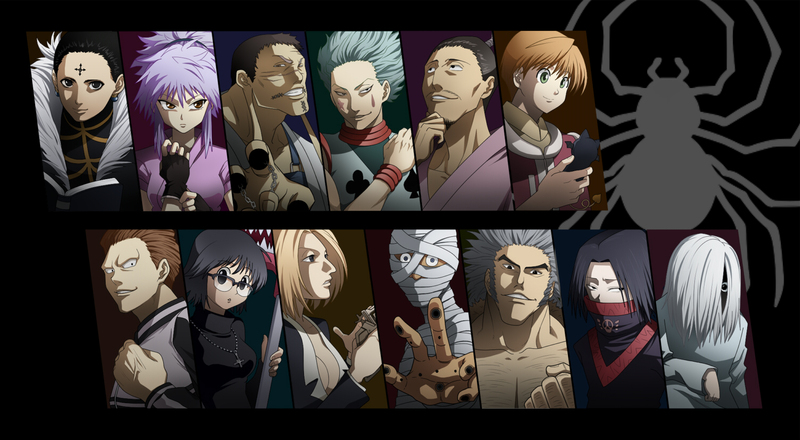 Expect a mix of cruel, quick-witted, and enchanting members under one leader with the power to copy other Nen abilities. Surely unbeatable! Not until their encounter with newly-proclaimed Hunter exam’s passers, Gon, Killua, Kurapica, and Leorio, who were reunited by the biggest auction in Yorkshin. Kurapica fought the group to his strength’s end, eagerly targeting the leader, Kuroro. Compare to the previous arc’s fighting fest, there are fewer battles here to see. Though Gon’s story was never left out as he seemed to be coming closer to finding his father, the backstory of Kurapica’s hatred towards Genei Ryodan was the highlight of this arc. Stay put and allow yourself to be astounded ’cause there are more striking scenes and exciting characters to see here! It has been a long time since I have seen the anime. Been reading the continued manga in mangastream.com but the story is not focused on the Genei Ryodan anymore. I hope to see the new anime version of the manga though. I love the part of the “Spiders” Arc but the most exhilarating right now is the *spoiler alert* Dark Continent. Oh I wish, the mangaka of HxH will be back already.